Three versions of the Anita 1211 are known; two with the Rockwell Anita 1211 name with orange gas-discharge display, and one with the Fi-Cord Anita 1211 name with a green vacuum-fluorescent display (VFD). 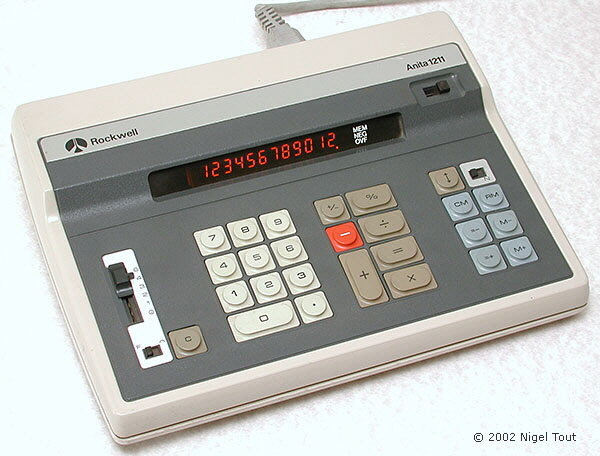 Rockwell Anita 1211 (type 1). Display is 12 digits, amber gas-discharge, Burroughs Panaplex II. Integrated circuit - Rockwell A1150BP (here date-coded week 1 of 1974). 252 x 194 x 56 mm (9.9" x 7.6" x 2.2"). Circuit board here is stamped "1211 MAIN BOARD-PANAPLEX". The interior of the Rockwell Anita 1211 type 1, showing the Panaplex II gas-discharge display and the Rockwell chip. 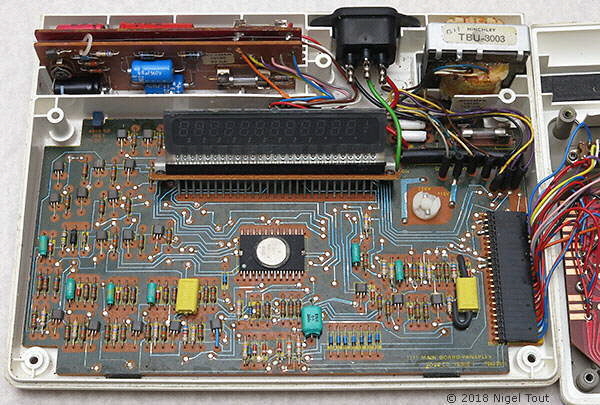 This machine was designed with room for rechargeable cells to replace the power supply board, top left, should a version needing them ever be required. Note that this model is very similar to a slightly later model which is labelled Rockwell Anita 1211SL, with the 'SL' (for Slim Line) designation. That model has a different display and other electronic detail differences. Rockwell Anita 1211 (type 2). Integrated circuit - Rockwell A4350PB (here date-coded week 42 of 1975). Circuit board here is stamped "8 March 1976". 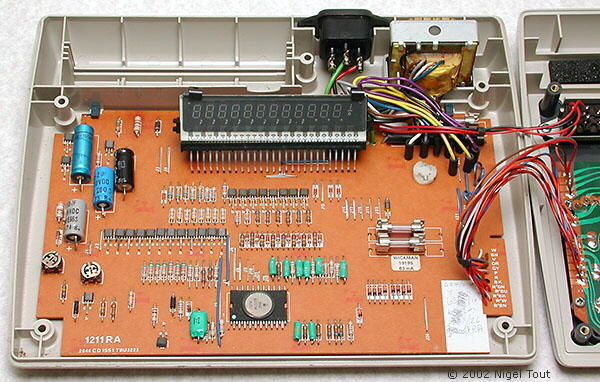 The interior of the Rockwell Anita 1211, showing the Panaplex II gas-discharge display and the Rockwell chip. This machine was designed with room for rechargeable cells, top left, should a version needing them ever be required. Display is 12 digits, green vacuum-fluorescent display (VFD). Integrated circuit - Rockwell A4350CB (here date-coded week 41 of 1977). This model is labelled for Fi-cord Ltd. of Didsbury, Manchester, and was made in Yugoslavia. 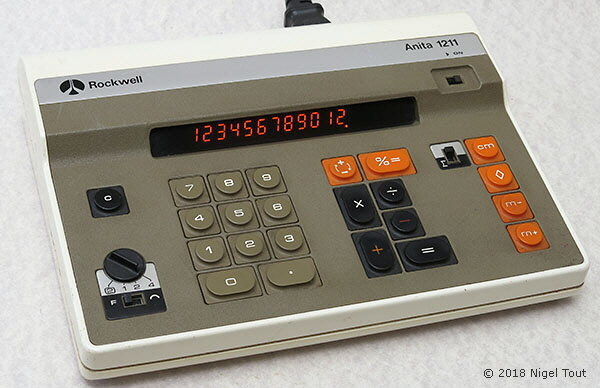 As mentioned by John Sparkes on the page The Demise of Anita & Bell Punch, around 1976 Rockwell decided to exit the calculator market and "an electronics company was founded in Nis, Yugoslavia, which was interested in buying both the design and the production facilities of our hand-held calculators". Fi-cord was a marketing company for consumer electronics and had already been a distributor of ANITA hand-held calculators. Its involvement with the operation in Yugoslavia is not known but it had some of the ANITA models made there labelled with its name. 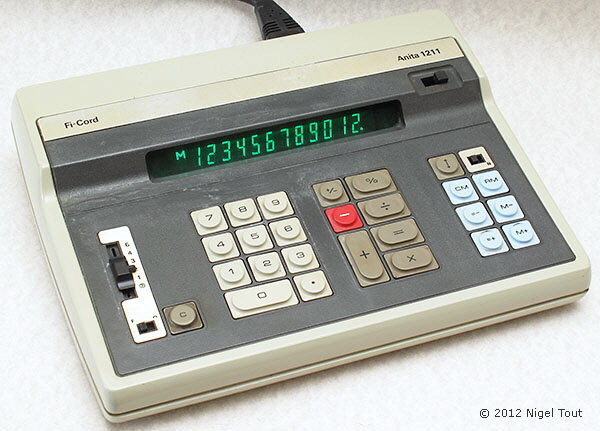 Besides this model there is also the Fi-Cord badged ANITA 8041 hand-held calculator, again made in Yugoslavia. 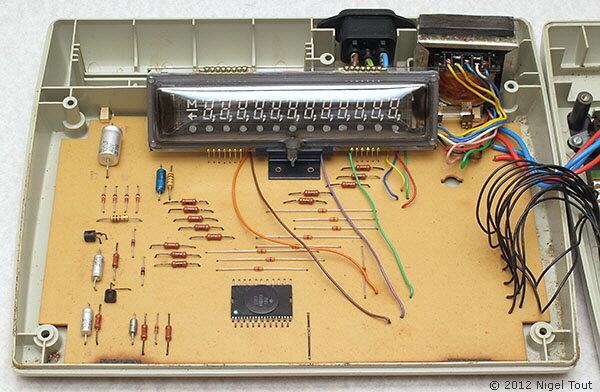 The interior of the Fi-Cord Anita 1211, showing the vacuum-fluorescent display (VFD) and the Rockwell chip on the much simplified circuit board, made possible with the advances in the electronics. The casing of this machine is identical to that of the Rockwell Anita 1211 type 2, above. The sales brochure "Calculators & Computers" (here in pdf format) of the Yugoslavian company Elektronska Industija, which obtained the design and the production facilities of ANITA calculators around 1976, shows the model Ei 1211 on p21.